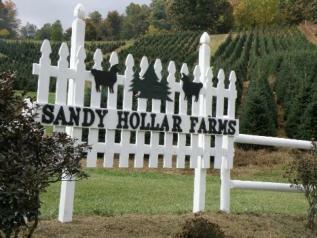 Welcome to Sandy Hollar Farms. This is the sign you will see as you arrive at our farm. Please turn left into the gift shop area to find parking. Someone will be glad to assist you in finding your perfect tree. Be sure to visit our gift shop and snack shack while waiting to take your turn on the hayride. Hours are from 9 am until 4 pm. Please plan your visit so that you arrive well before 4 pm so that you may have time to pick your tree. When the sun starts to go down, it can get dark and cold very quickly. 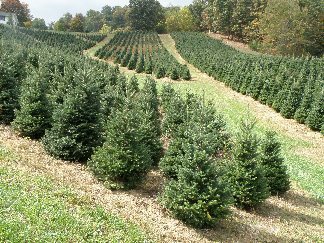 We are a family farm with Choose & Cut Christmas trees located in Sandy Mush Valley in Leicester, North Carolina. We offer choose & cut Christmas trees in a large variety of sizes. At Christmas time we have hayrides, fresh wreaths and garlands as well our Christmas shop.